There are some things that we feel we are never doing right and washing our hair is one of them. Some women feel like they’re not washing it nearly enough, while others feel like they’re washing it too much. The answer to this problem is knowing your hair type. Different types of hair need different kinds of treatment. Here are few quick tricks for shampooing your hair if you are in dilemma on how often it is recommended to wash your hair. Shampooing shouldn’t be the biggest concern for women who have curly or voluminous hair. Because of the type of your hair, the strands of your hair will probably be able to avoid the build-up of oil, because it takes some time for oil from the scalp to come down the strands of thick hair. It is not entirely out of mind to wash your hair one time a week. Women who have fine hair should wash it more often because fine hair can absorb more oil than other types of hair. You should wash your hair on a daily basis if you can, particularly if you go to the gym. For some women, this might be a problem, so a quick couple of spritzes of dry shampoo are an effective substitute, helping to soak up any excess oil in your hair. 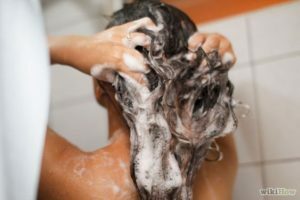 Continual shampooing might not be what your hair needs if your hair is in its natural form. As an alternative, use the „co-wash“technique. This is a technique where you supplement your shampoo for conditioner only. Continual shampooing may dry out your hair, while conditioner keeps it clean without damaging it. There are also some cleansing shampoos mad just for this reason – to moisturize and cleanse your hair without drying it out. For women with medium hair, washing hair 2-3 times a week will actually do the job. This type of hair is not accumulating as much oil as finer hair, but isn’t hiding oil as much as thicker hair does. Avoid, as much as you can, to wash your hair on a daily basis.